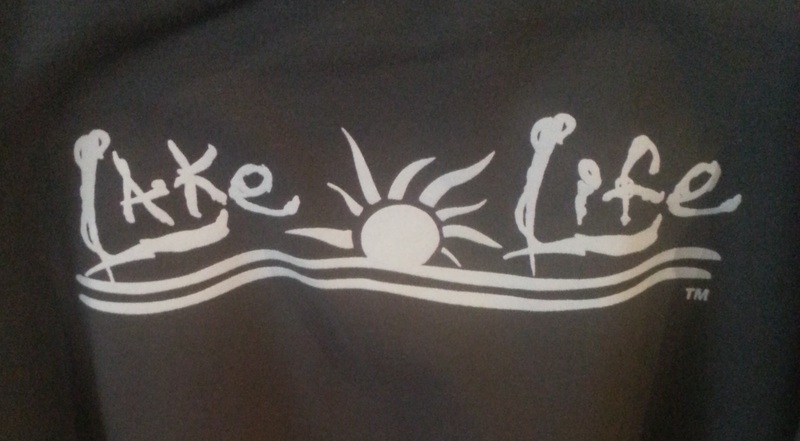 Man in the Lake – Lessons Learned..
After 15 years of working on a boat, the odds finally caught up to me. 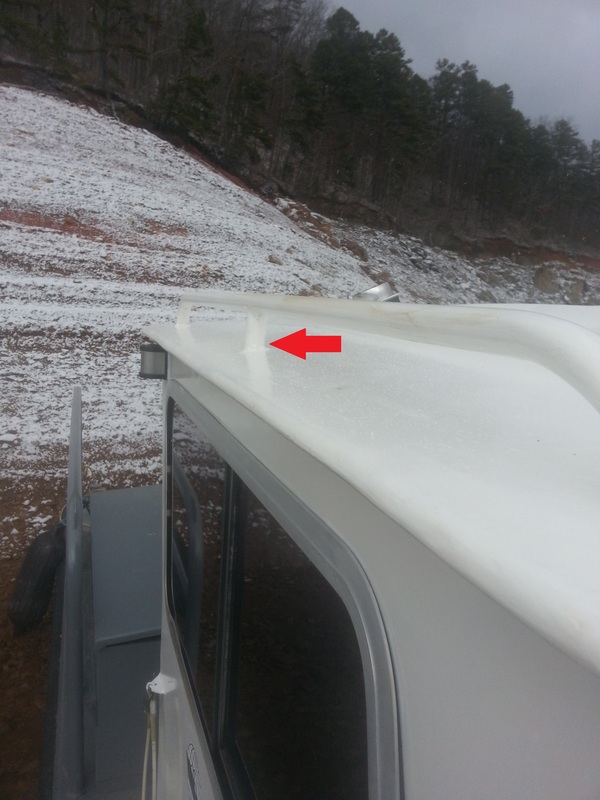 On Saturday, while working by myself, I fell off my boat and plunged into the 40 degree water of Fontana Lake. Just a couple weeks ago I stated in a blog post that “Getting caught out in crap weather overnight or falling in the lake are possible scenarios in my winter time work.” Well, I have both checked off now. Pictured above is one of the last pictures my iCracked phone would ever take as I retrieved it from my pocket. The tongue sticking out is a by-product of my exuberance and would have some type of Haka noise if there was audio. Moments later I would launch into an automated response to remedy my situation, but I will get to that later. 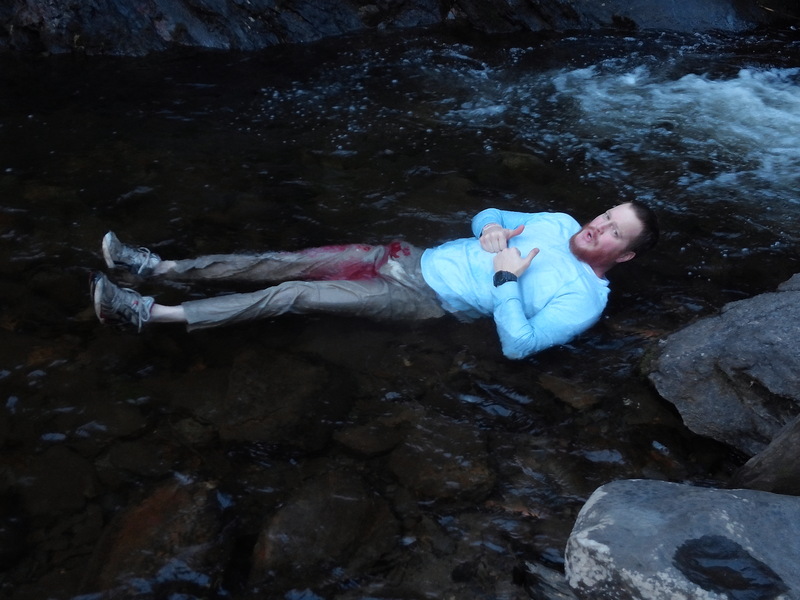 First, I would like to dedicate this post to my dear friend Turdis..
Former hoghunter and ranger, he is also a graduate of BPO’s Survival 101, so when I found out that he was taking the Wilderness First Responder class taught by my buddies,I asked them to make sure he got a nice soak in their final scenario. I have been assured that the red stain on his pants is fake blood and not the results of legendary, urine marking dye in the creekl. Karma, however, had other plans that day. Turdis volunteered and on the other side of the mountain, I was falling overboard. 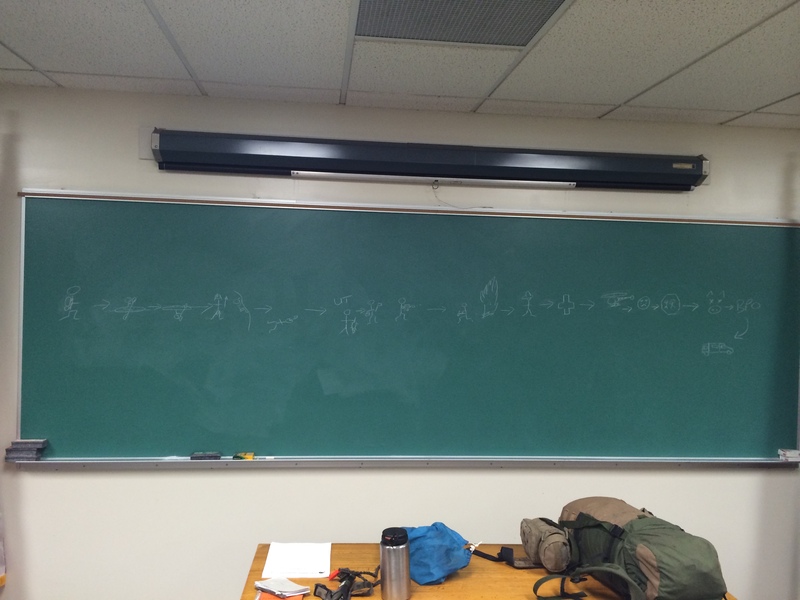 I also want to add this picture to my pictograph that I used for my introduction at the Pennsylvania Game Commission academy last week..
Before teaching, I was asked to introduce myself to 24 cadets and several members of the tracking team for the lecture part of the class. Having slept through two academies myself, I figured I would use a pictograph to depict my outdoor career and turn it into a teaching point. I used it to show my adventures, and more importantly misadventures, and discuss the importance of decision points and exposure. Each injury or incident brought about lessons, just like the one depicted in this post, and sharing them is a great learning tool and keeps the ego in check. The mini van at the end of the story is good for the latter as well. And while one student commented that I was accident prone, I really just have greater chances based upon the sheer volume of time spent outdoors and the cadets are no different. Starting down the path of resource protection, not only will they have to face the hazards of any typical law enforcement officer, they will also have a 30 year exposure to outdoor hazards, some of which can come unexpectedly, but a lot can be mitigated by the right mindset, skills, and gear. Fast forward to Saturday and you will find me pre-baiting traps halfway up the lake. That’s me and my boat, the red star. I am working through the weekend by myself to make up for my trip up North. 10 – 15 mph winds – check.. Perfect recipe for the last on my “bucket list” of survival scenarios. 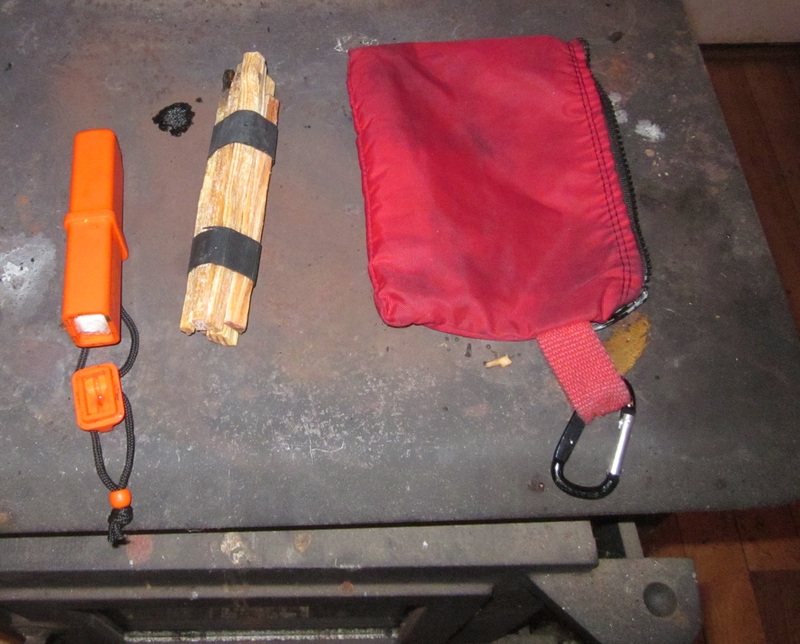 Immersion has long been the stalwart holdout on my personal experiences I use to convey the catalysts of wilderness emergencies, having been injured, disoriented, stranded, broken down, wrecked, caught out in bad weather, and caught out after dark without a flashlight, all in a wilderness setting. Okay, time to shut up and get to the part where I get wet. 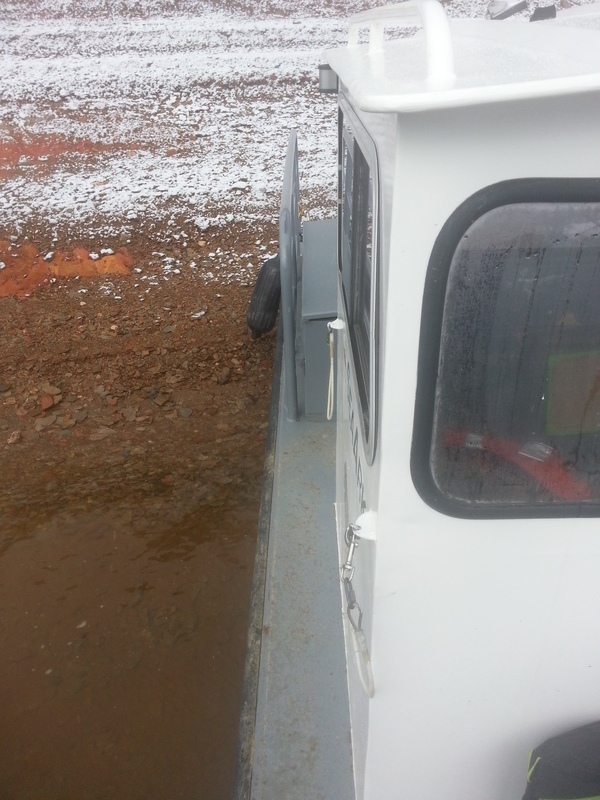 The lake is way down this year, so when I pull into our usual parking spot, it is too shallow. I back off and aim for the left bank, which is steep and rocky. Our slam anchor has long since disappeared, so we have been using a 20 pound navy anchor and piling rocks on it to hold the 24 foot SeaArk mini-barge. Not a lot of room for a gun toting, pack wearing 200 pounder, but there is a handy rail up high to hold onto as you slide around. A conservative estimate of the number of times I have slid around that cab over my career would be upward of 10.000 times, and my body rounds the corner, grabs the bar, and slides forward on autopilot.. The red arrow shows the location of the vertical support that my hand has to skip in order to keep sliding forward. Whether or not my new gloves and new pack were minor contributors to the unfolding events, at the exact moment my hand was skipping the vertical bar, a gust of wind pushed the boat sideways and I grabbed thin air. 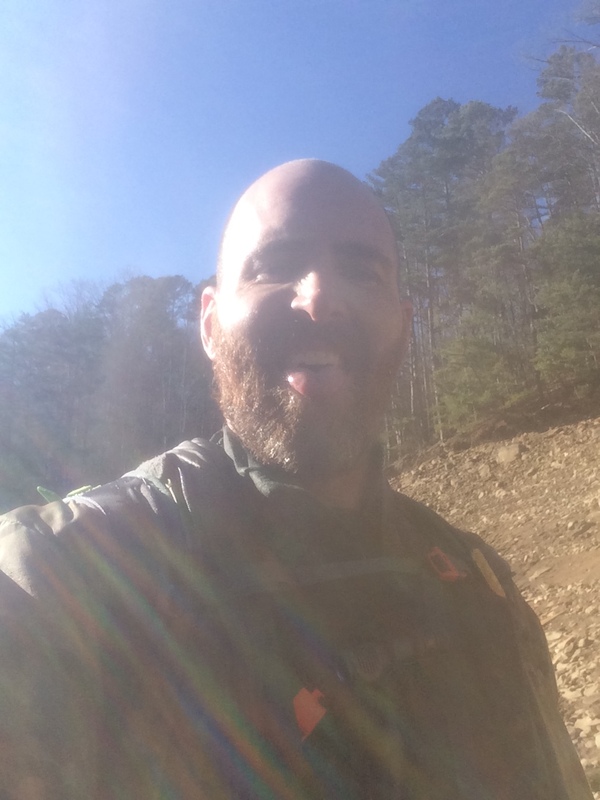 The image of my multicam gloved hand reaching for the bar seemed surreal as I fell backward into the water wearing my pack and rifle slung around my neck. The water was about 8 feet deep at that point, but I popped back up to the surface. My pack, which contains a cut down closed cell pad and dry sack for it’s bulkier contents added to my bouyancy as I made the short swim to shore. My rifle, slung neck only to ditch in case of this very situation, was noticeably heavy while swimming, but made it with me. The first thought, having done multiple “Man in the Creek” drills, was how much warmer the water felt with all my clothes on. It hovered in the high 30’s all day, so I was layered up, head to toe, with merino and synthetics that were picked for this very event. All my layers pictured below.. When you train for something and it finally rolls around, you can’t help but be excited at the chance to put your training to use. My already great day had just got a thousand times better and it took the next thought to snap me out of my exuberant state. Deep in my water logged pocket was my “new” phone. In the last two years, I have killed two Kyocera Torques that are supposedly “Bear Grylls” proof, so I switched to an iPhone 5 after the demise of my last one. On the list to buy was a Lifeproof case, but on day 2 it fell off my truck and smashed the screen. My buddy gave me a case last week, so I figured I would fix the screen before I threw it in the case. Those plans were never completed, and amazingly after the plunge, it worked, only to die a day later. Phone taken care of, I went into autopilot, wringing out my clothes just like any Survival 101’er, and whipping out the garbage bag from my survival kit before I realized I had my pack with me. 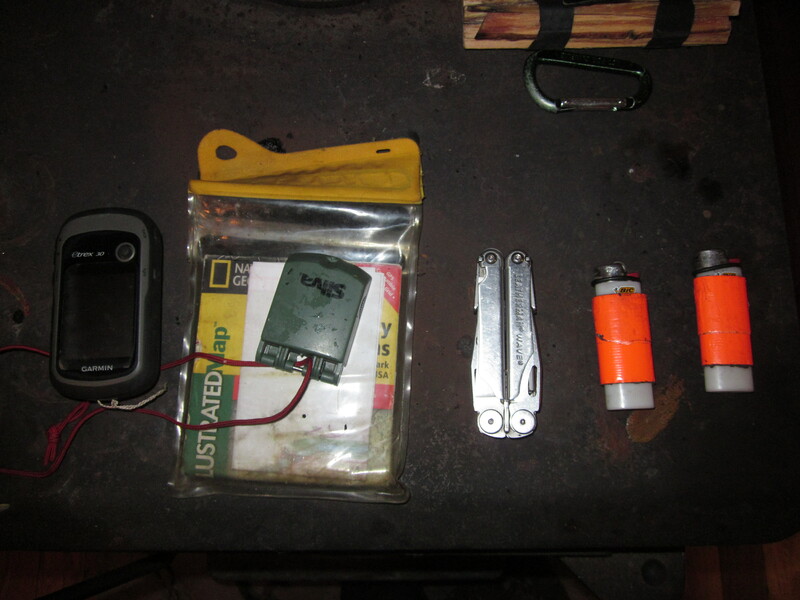 We always train worst case scenario of pocket kit only, so having the luxury of my pack was a welcome realization. In the dry sack is a complete change of base layer, socks, a primaloft vest and a primaloft quilt (woobie), that I carry since I was stranded years ago. 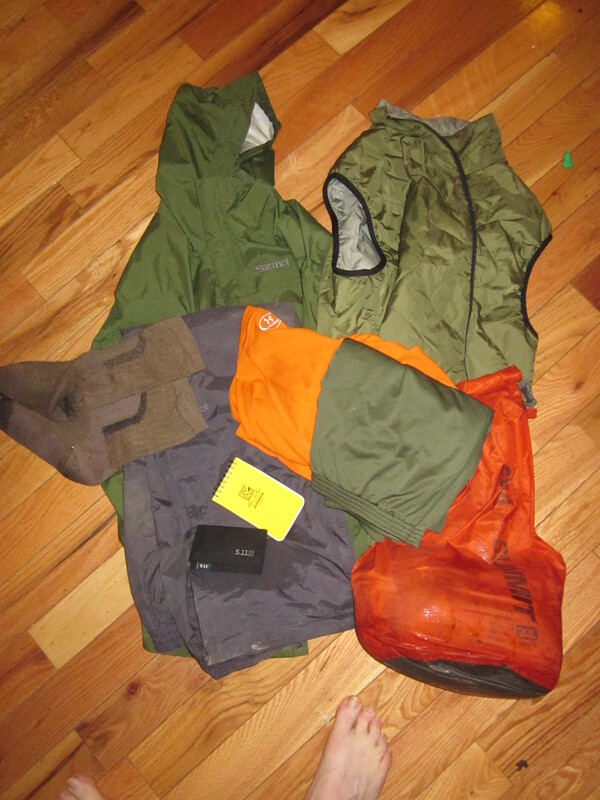 Off go the wet clothes, on go the dry ones, and I topped everything off with my rainsuit. Good as new and I used the garbage bag for the wet items. “Old Andrew” would have kept working at this point, but wiser in age now, I realized it was time to head in since my radio and phone both got soaked and I wasn’t sure if they would pull through. Back at the boat dock, I maintained my professional demeanor and politely refused the offer to use the cart to haul my “tras”h up the ramp, keeping my swimming escapades to myself. I figured I would save myself the ribbing for a couple days when I didn’t have a bag of soggy clothes to add to the jokes, but I did have to make one call to my survival buddy. His response was the exact same as years ago, when I called him from the hospital and told him I got snakebit. Robert – You didn’t get injured did you? Robert – That’s so cool!! Like me, using and validating our training is very rewarding in an unplanned event. We both love to push ourselves in training and have seen positive results when actual events happen. So on to lessons learned. 1. I recently had a discussion with a very experienced SAR trainer about the merits of the “Man in the Creek” drill and the associated risks. While our opinion differs slightly, we both agree on mitigating risks in training, with me edging towards increasing the intensity. Now more than ever, I stand by my training protocol, having witnessed first hand the benefits. 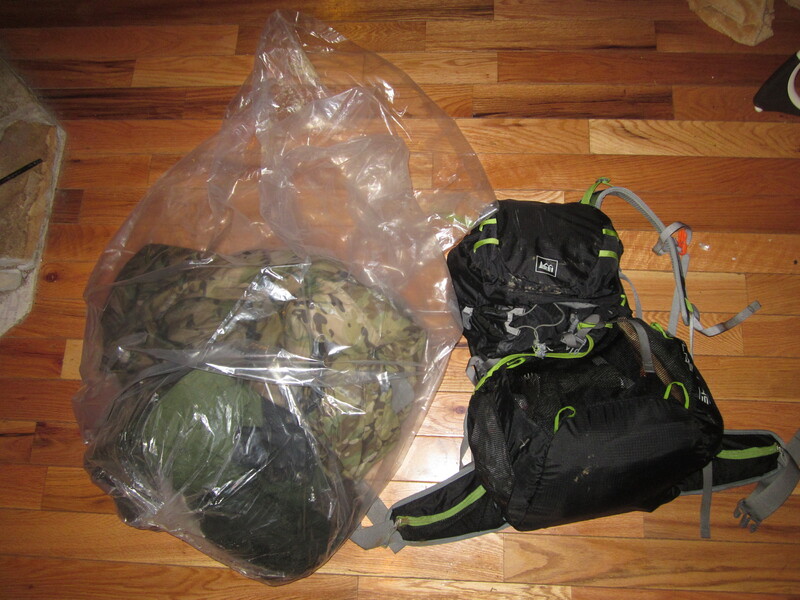 My only tweak will be to address the prospect of having your backpack, even though we train for a “lost pack” scenario. 3. The Sea-to-Summit bag in my right cargo pocket containing my navigation tools leaked, not a lot, but enough that I will be sourcing a replacement. 3. Both lighters were waterlogged, but working after I gave them some love. 4. 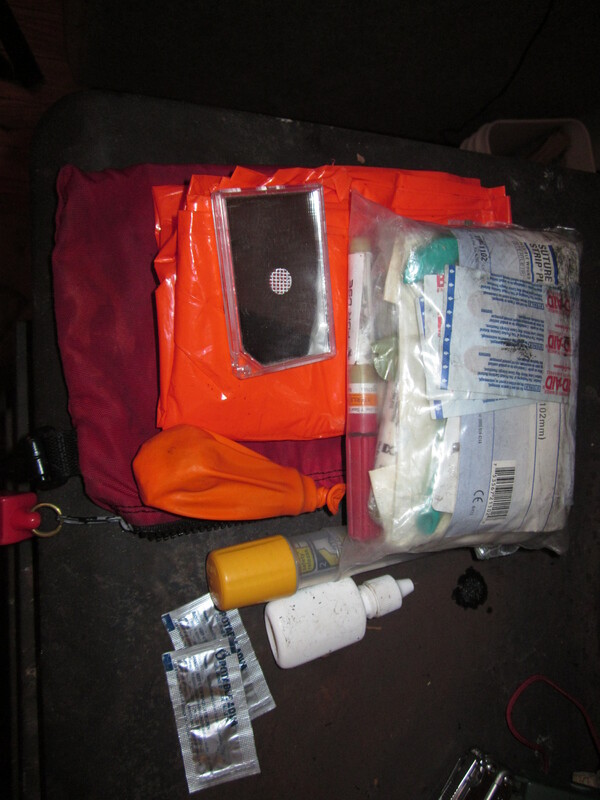 The components of my first aid kit stayed dry, but I think I am going to double bag it from this point on. 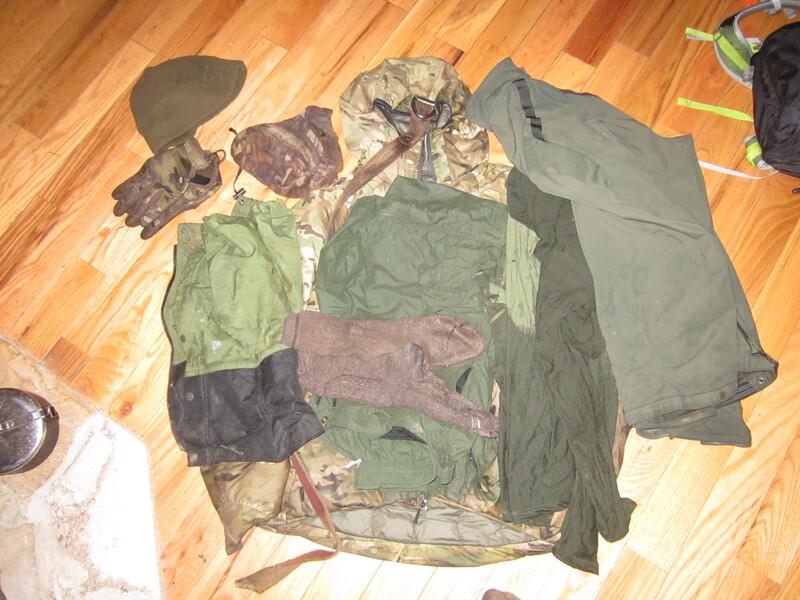 All my other gear’s performance was not affected by the water because of it’s nature (canteen, cook kit, etc.) and my headlamp worked fine. 5. That falling in the lake is a great way to justify the mobile radio we need mounted in the boat. My portable radio made the swim okay, but if both it and my phone went down, I would have been out of luck except for the float plan I called in earlier that day. 6. Two hours before my swim I had been daydreaming of a new anchor system that I had come up with years ago. It would have prevented the boat shift and my procrastination on that project needs to end. 7. Plans are now in place for backpack storage on the front of the boat, so we don’t have to walk the ledge with our packs and rifles, and can wear our lifejackets up to the point of stepping off the boat. **Update – 1/29/15 – Completed. 8. We have sleeping bags, pads, and a tarp on the boat. A dry sack of clothes will be added soon, complete with a change of shoes. My waterlogged boots soaked through my dry socks by the time I got to the station. 9. I can’t wait to test how much buoyancy my pack provides. While I unbuckle it during creek crossings, I keep it buckled on open water so it doesn’t get tangled up with my gun sling. I have swum with a pack on before during a canyoneering trip, but I want to experiment more now. 10. It is great to have a boss that came up through the field. He understands the exposure and took a plunge in the reek himself back in the day. On Monday, I told my hunting partner. We had our laughs and then started planning on how to prevent it from happening again. I could have kept it all quiet, nobody would have known, but to do that robs me, him, and everyone else of a great learning opportunity and brings to mind a poignant quote..
It’s not all Budweisers and bikinis when you work boat patrol. Having the right mindset, skills, and gear should be passengers on every trip.. 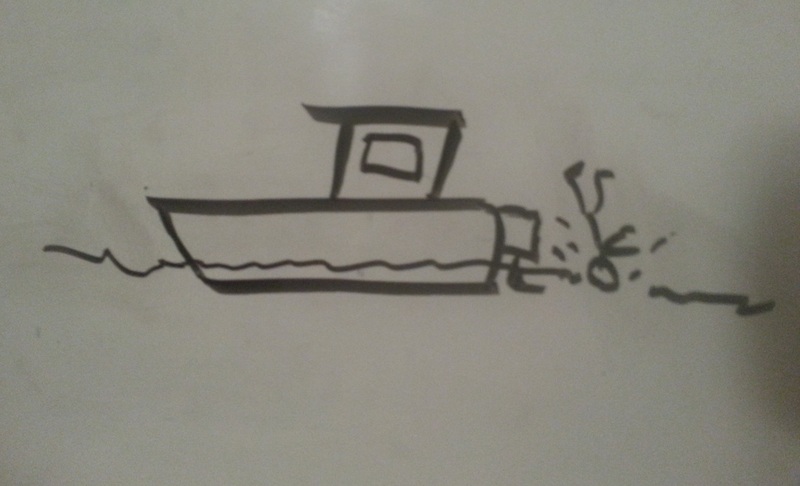 This entry was posted in Survival Weekly and tagged boater safety, water safety, wilderness survival on January 29, 2015 by bigpigoutdoors. Good post and a great read Andrew. I’ve been meaning to talk to you about the potential for doing an export training up here in northeast Montana. The terrain is quite a bit different than the wooded areas you train in now. I think the outdoor community could benefit from some training focused on being stranded on the prairie in blizzard like conditions. I first thought of this when I had to go help a hunter track a whitetail he had shot which wound up a closed portion of the refuge. It was about 10 degrees below 0 that day and I was about a mile from the access road when a blizzard hit. It is unbelievable how quickly weather like that can affect your cognitive and motor skills. Not to mention how quickly you can become disoriented when you are squinting to see 5 feet in front of your face. Thanks. Just talked to Harold and he said he was amazed that he never fell in or that it hadn’t happened yet. Awesome post. Thanks for sharing your shame haha. Just adds to your credibility. All of the pics really help us get a sense of the scenario, too. Good job. Thanks Todd. The burnt hand teaches best. The cold, wet one does too! !